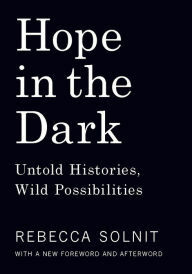 Hope in the Dark is a short book of essays about the importance of recognizing small victories in the face of what seems insurmountable challenge. Solnit is a radical activist who passionately protests many issues such as NAFTA, the destruction of the environment, and war. The book was beautifully written – Solnit surely knows how to compose a sentence. Another issue I had with the book is it assumed prior knowledge of the issues such as why NAFTA is bad. I’ve never thought about NAFTA in the past – in fact, I only became aware of it being a controversial issue when Trump recently suggested nixing it. Perhaps that’s a lack of awareness on my part, but I would have appreciated more information. But explaining the issues was not what this book was about. This book was about hope, not about education. Because of this “flaw,” I found the book very boring in parts – I’m a fan of educational books more so than uplifting ones. That said, I totally understand why people are moved by this book, and I appreciate the timeliness of preaching hope in the appearances of failure.